In 2013, Hollandcodes.com will launch a NEW Virtual Paint Careers With Colors Learning Center for elementary and middle school students. View our NEW flip book sample. 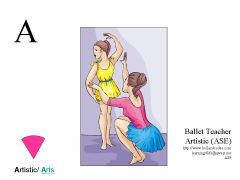 There are two versions – the RIASEC Version and the Children’s Version. The RIASEC Version is for Middle School students. For Middle School students, the RIASEC Version should be used with the Self-Directed Search Career Explorer. 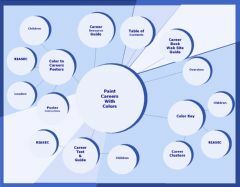 The Paint Careers With Colors Kids Career Sheets uses self-by-step activities, career games for Kids, and kids activities for career choices to highlight Holland Codes or Colors to Careers Codes. On each web page, you choose the careers that you like or are interested in. At the end of the job test for kids, you summarize your results. 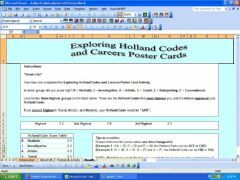 The Summary Sheet identifies your Holland Codes or Colors to Careers Codes. 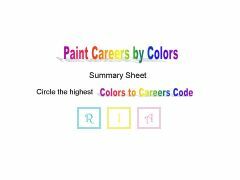 The Paint Careers With Colors Kids Career Test comes with a Colors to Careers Career Model, Colors to Careers Code or Holland Code Descriptions, and Color Key. The Paint Careers With Colors Child Career Test is an excellent tool to introduce you to career exploration, Holland Codes, and Colors to Careers Codes. The graphics hold your attention as you identify your career interests. The Career Tests are printed on heavy-weight glossy, durable paper! 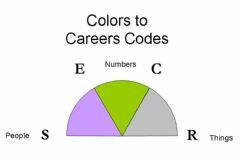 Over three hundred (300) Colors to Careers Posters feature graphics, Holland Codes, and Colors to Careers Codes. The Colors to Careers Posters are Easy Scoring. You sort the posters quickly according to likes and dislikes. 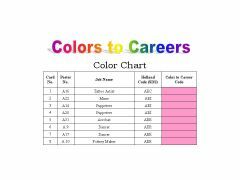 At the end of the poster sorting exercise, you will have your Holland Code and Colors to Careers Code. The posters are an excellent way to explore careers. The poster shows you’re the relationship between Holland Codes, Color-to Careers Codes, and careers. The Analyzer program is an alternative to the paper and pencil model of RIASEC Paint Careers With Colors. The Analyzer will automatically produce the three let code based on the selection that the test taker provides. The Holland Codes Occupational Poster Scoring System is an automated poster scoring system. Clients, students, and children will enjoy making their selections and with just the click of a button have their unique Holland Code results displayed on the computer screen. 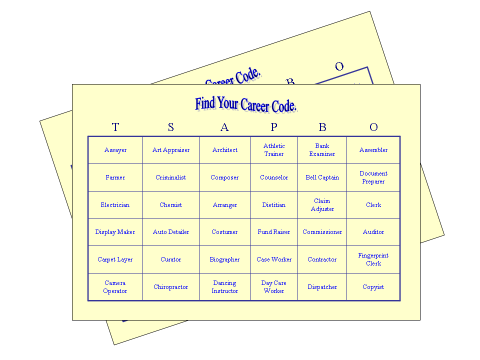 You will enjoy using this career exploration activity. Use the Starter Kit to promote the Paint Careers With Colors System. The flyers and News Release help to advertise the Program. The News Release advertises the beginning of the Paint Careers With Colors System. Send out the News Release prior to starting the system. 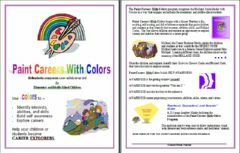 The Children’s and Adult’s Flyers provide information about the Paint Careers With Colors System. Use Name Tags and Tent Cards to identify children, students, teachers, counselors, or parents. Individuals place stickers on Name Tags and Tent Cards. The Stickers lists the 6 Holland Codes or 6 Colors to Careers Codes. When the children or students have completed the Career Test, they will be instructed to place the correct labels on their Name Tags and Tent Cards. The Stickers identify each individual’s Holland Codes or Colors to Careers Codes. The Children’s version of the Unlock Your Treasure Chest Guide to Career Exploration is used in conjunction with the Self Directed Search Career Explorer and the Paint Careers With Colors System (Children's and RIASEC Version). The Unlock Your Treasure Chest Guide to Career Exploration is for kids and children who need a manual that will guide them through the steps of exploring careers. Day Six: Get Your Holland Code. Discover their interests, abilities, and skills. Find out what makes their personality tick. Explore careers with middle school students, children, and kids. Link careers to interests, abilities and skills. The flash cards are sold in CD Collection. Click on the "Expand" link to enlarge file. Click the "ESC" button to exit career test. Thank you for your interest in the Paint Careers With Colors Program. To get more information, please complete the registration form.